London School of Hygiene and Tropical Medicine (LSHTM), United Kingdom in partnership with the University of the Philippines (UP) and the Philippine Genome Center (PGC), Philippines. The Philippines continues to witness infectious disease (ID) outbreaks. HIV, TB, malaria and dengue are serious public health concerns, imposing a significant burden on healthcare services. ‘Omics technology has emerged as a way to perform active surveillance, rapidly identify drug-resistant pathogens and assistant ID control and management. ‘Omics refers to collective technologies used to investigate, interpret and analyse functions and interactions of the different molecules (DNA, RNA, and protein) that constitute cells of an organism. However, there is a critical shortage in the Philippines’ capacity to utilize and deploy ‘omics. This five-day workshop, to be held at the National Science Complex, University of the Philippines, Diliman, Quezon City, Philippines, is designed to develop analytical and operational capacity and builds on a successful Newton-funded Genomic Epidemiology workshop (July 2017). For this iteration, we will extend the scope into broader ‘omics, including transcriptomics and proteomics. The workshop will consist two symposia on ID ‘omics and control, flanking a hands-on analytical/computational short course in ‘omic data generation and analysis. provide hands-on experience with the generation and analysis of ‘omics data, including the application of portable sequencing and processing of the resulting big data. Advanced users are allowed to develop more advanced analysis pipelines. The first and fourth days of the workshop will be held at the Institute of Biology auditorium, and will feature keynote talks on the use of –omics technology for disease control and management, the role of the PGC and its links to public health. There will also be a poster session on the second day for participants who would like to share their research. The second, third (whole-day), fourth and last days (half-day), which will be held at the Philippine Genome Center Training Rooms, will involve hands-on analytical/computational short courses covering the analysis of raw ‘omics data, integration, and correlation with disease outcomes. Applications must be submitted before the extended deadline, October 14, 2018 (Sunday). Participants may range from MSc graduates and research assistants with extensive research experience, to PhD graduates and early-career researchers with a maximum of 10 years post-PhD research experience. Participants are required to bring a hard drive or USB with at least 8 GB usable memory for the workshop. Please note that participants are expected to attend all sessions of the workshop. Those who are not chosen to participate in the hands-on workshop are welcome to attend presentations and discussions on Days 1 and 4. Attendees of the symposium and workshop participants are also encouraged to participate in the poster session to be held on November 6, 2018. 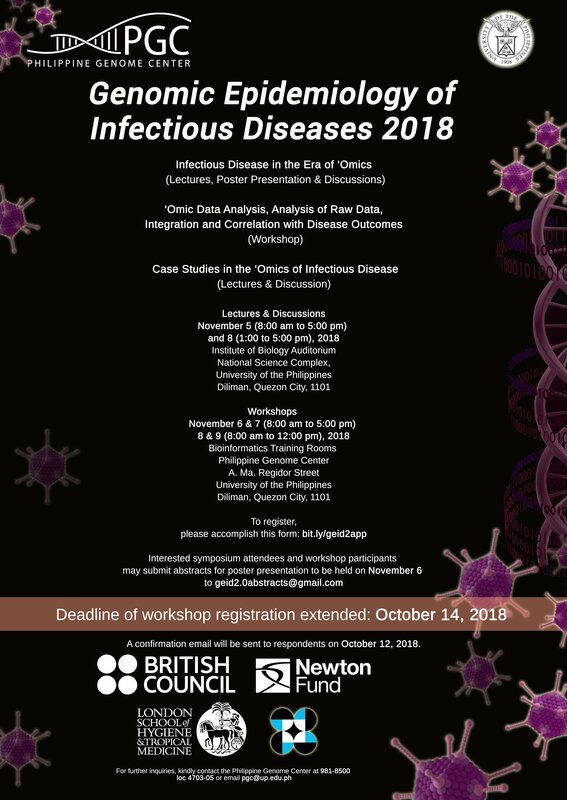 Abstracts relating to the genomics, transcriptomics, proteomics and bioinformatics analysis of infectious diseases must be sent to [email protected] no later than October 8, 2018 (Monday). Abstract must be written in English with the font Arial, size 11 pt, single-spaced, and justified on MS Word. Name(s) of the author(s) must be below the title and underlined. Abstract should contain an introduction, objectives, major findings, and conclusion, and should have no more than 300 words. Poster should be 2” x 3” feet and contain the abstract, introduction, objectives, methods, major findings, and conclusion. The British Council and the Philippine’s Department of Science and Technology (DOST) will cover the costs related to workshop participation, including: travel, accommodation, and meals. Although this cost will not be covered by the British Council or DOST, participants are encouraged to purchase an adequate travel and medical insurance. The British Council accepts no responsibility for any problems which may occur when the participants are in-country.